Established in 1964, South West Essex Choir is a large, friendly and sociable choir of mixed ability ranging from the very experienced to those who do not read music. We aim for high standards and pride ourselves on the quality of our music-making. We sing a wide range of music from sacred such as masses and requiems to lighter works such as opera choruses, the african-jazz inspired piece, Zimbe! and Mass in Blue. It was inspiring and truly riveting… never heard them on better form… concert was of international standard. We follow the academic year, rehearsing works to be performed at a concert at the end of each term – in October/ November, April and July – mainly at churches in the local area and at Walthamstow Assembly Hall. On alternate years we hold a Family Christmas Carol Concert in aid of charity in conjunction with a local school choir . The choir has a calendar of social events, notably the Christmas and summer socials, at which everyone comes together to have fun and celebrate our achievements. In September 2014 SWEC made its first appearance abroad in Sospel, the medieval small town in the Alpes Maritimes in France. Over 300 people came to hear our performance in the town’s stunning baroque cathedral and gave us a standing ovation along with a glowing review in the regional paper. 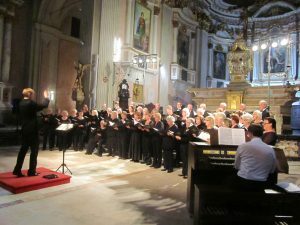 SWEC returned to Sospel in September 2016 to perform the Messiah and will return again in September 2019. SWEC is managed by a committee of about 10 members who undertake all aspects of running the choir from membership, finance, publicity and the staging of concerts, to working closely with the musical director in developing a programme of music for each season. Interested in singing? Visit the join us page to find out how to become a member!